ONE OF THE BEST THINGS about apples is their versatility. They can be served at any meal, in any course, cooked or uncooked, in combination with countless other foods. Apples are the perfect snack, too: sweet but healthy, easy to eat and carry in a pocket or hold in your hand. Apples can be both sweet and tart, and their flavor and texture change when cooked. As a result, they can be combined to great effect with foods as disparate as cheddar cheese and raisins, eggs and pork, sugar and mayonnaise. There’s no bad time, or way, to eat an apple. One place to test out this assertion is with sandwiches. There are all kinds of variations that include the crunch and flavor of apple with a favorite ingredient of choice. One simple sandwich is to replace the jelly in a PBJ with slices of fresh apple, such as McIntosh or Empire. Add a handful of dried cranberries or a drizzle of honey or maple syrup for a twist. The other day Chris Weeks of Hatfield, Massachusetts, opened a can of tuna fish, and when he went to the fridge looking for mayo, he couldn’t find any. Instead he found a jar of applesauce, and stirred it into the tuna, adding a few fresh Cortland chunks. The result was decidedly different, but pleasing. A day later he found a Fuji and tuna sandwich in the deli at a local grocery. It included lettuce, mayo, and tomato, but otherwise seemed identical to his ad lib. Chris keeps experimenting, and has developed a great new variation on grilled cheese. We include it here with another favorite of ours, an open-faced broiled sandwich that is easy to make. It admirably demonstrates how apples can combine with unusual ingredients to take the ordinary to new culinary heights. THIS UNIQUE SPIN on a pair of classic comfort foods combines the warmth of a New England apple pie — complete with Cheddar cheese! — with the youthful exuberance of French toast. 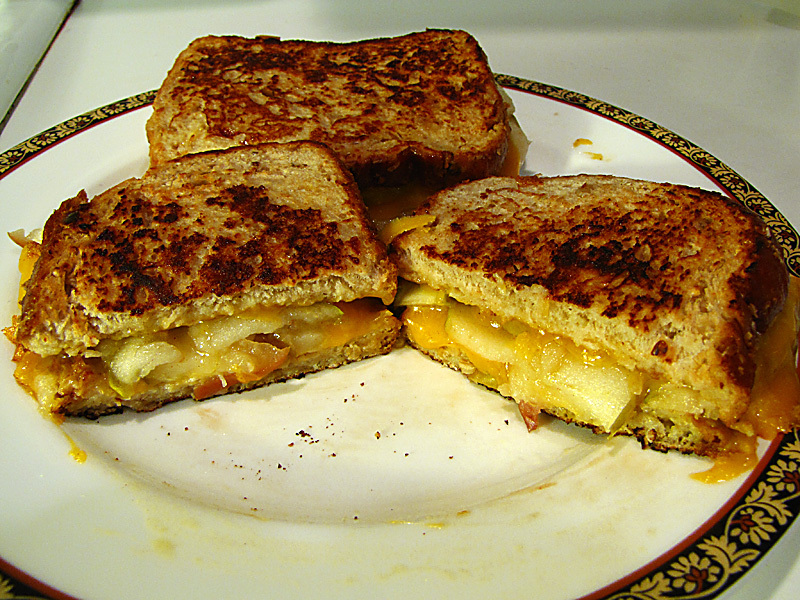 The result is a sweet and savory grilled cheese bursting with warm, gooey New England apples and sharp Cheddar cheese. There is no shame in using a fork and knife on this one! Core and thinly slice apple. 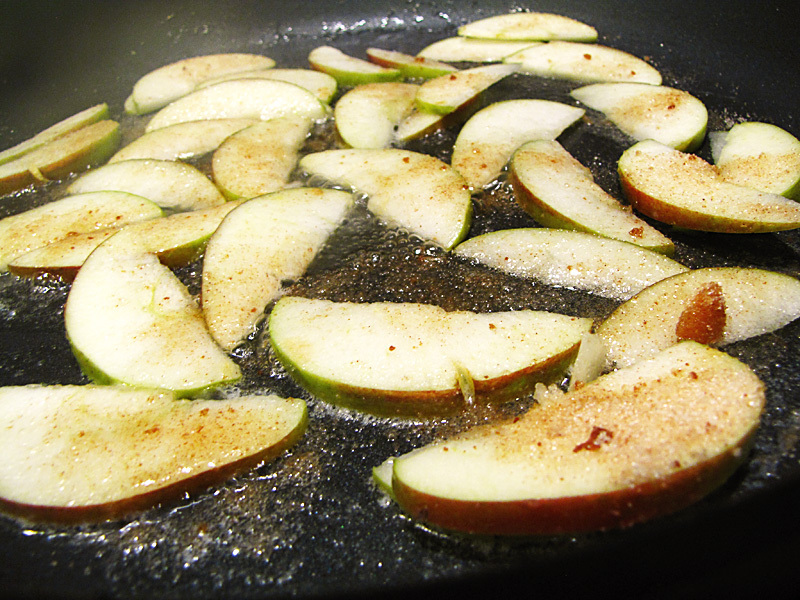 In skillet, sauté apples in butter over medium heat until medium-soft, about 2 minutes. Remove from skillet, sprinkle with 1 T cinnamon-sugar, and set aside. In shallow bowl or pie plate, whip egg, milk, and 1 T cinnamon-sugar. Dunk bread into egg mixture and add to skillet, browning both sides over medium heat. Arrange cheese on all four pieces of the toast. Allow cheese to melt slightly before placing apple filling on two pieces of the toast. Top with remaining pieces of toast, slice in half, and serve hot. Spread mustard on bread; top with apples, onion, and cheese. Briefly broil until cheese is bubbly. A GREAT LATE-SEASON sandwich apple is Spencer. It’s a relatively new (1959) cross between McIntosh and Red Delicious. Spencers are crisp, juicy, and sweet, but less so than a Delicious. Nearly solid red in color, they are an outstanding apple for both fresh eating and culinary use. You won’t find them everywhere, but they are worth the search. A more readily available choice for sandwiches is Fuji. Popularized in Japan and Washington state, it is grown in New England, so look for your local variety. 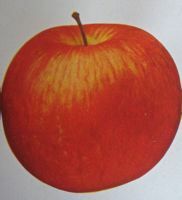 Fuji is a medium to large apple, with orange-red skin. Its flesh is firm, crisp, and juicy. Fujis are excellent eating apples, and good dried in slices. They also keep well, maintaining their quality for up to a year refrigerated or several weeks left in a fruit bowl. Fujis ripen in late October. Fuji was developed in Japan in 1939, but it was given its name in 1962. 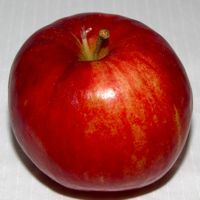 Named for Japan’s tallest and most sacred mountain, Fuji is a cross between a Ralls Janet, an heirloom variety from Virginia, and Red Delicious. One good variety to choose is Mutsu. They make outstanding sauce and cider. Also known as Crispin, Mutsus have a sweet, light flavor when cooked, and hold their shape well. An excellent dessert apple, they are also especially good in salads. 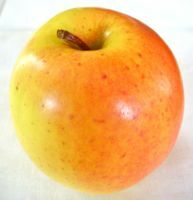 Mutsus are a late-season apple ranging in color from greenish to yellow, with an orange blush. Their firm, juicy flesh is creamy white to pale yellow. They can grow quite large (a pie made with Mutsus may require as few as three apples). WITH THIS FALL’S EARLY HARVEST, mid-season apples like Empire and Jonathan are already available at farm stands and stores. 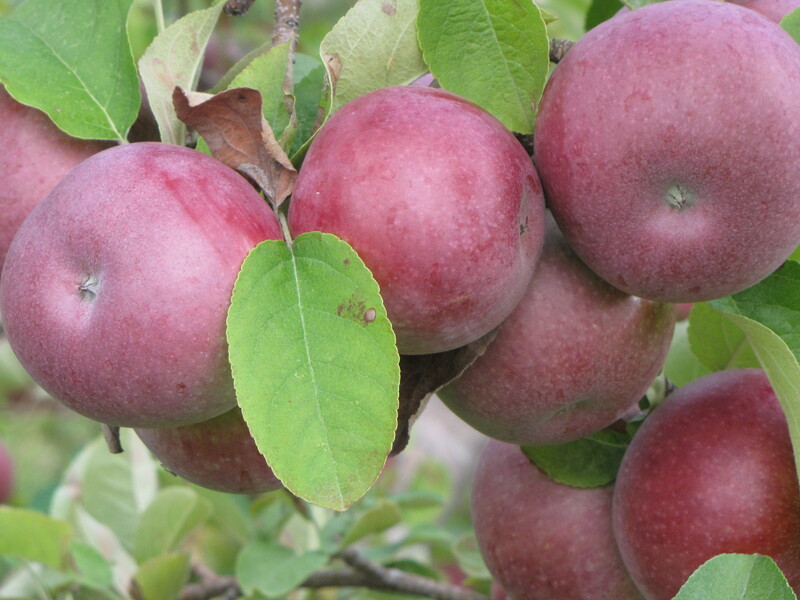 There will be plenty of apples throughout the fall, but if you want to pick your own, you should plan to go this weekend or next, at the latest, except for parts of northern New England (call the orchard to see what is being picked). 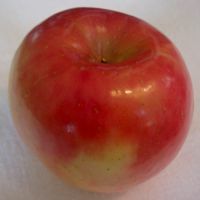 The Empire apple is a cross between McIntosh and Eastern Red Delicious. The result is a variety whose flavor is sweeter and less tart than a McIntosh. Empires have juicy, firm white flesh that does not easily bruise. 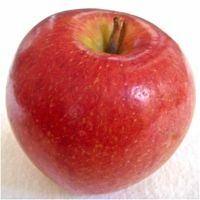 They are high-quality dessert apples and good for all culinary uses. They have a deep red skin brushed with gold and green. Empire is a newer variety, raised by R.D. Way in 1945, and introduced commercially in 1966 by the New York State Agricultural Experiment Station in Geneva, New York. 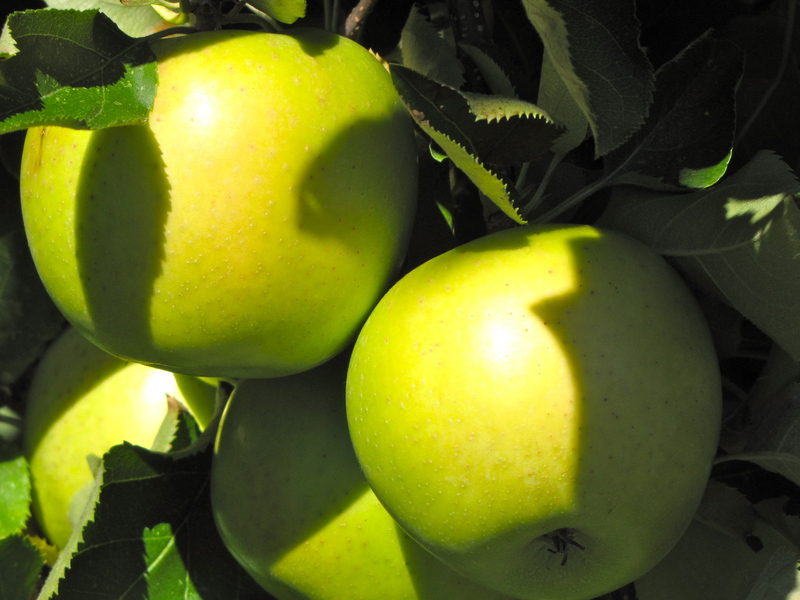 Jonathans are a popular cooking apple, with a spicy, tangy flavor. Their flesh is crisp and juicy, and they have a deep red skin. Applesauce made with Jonathans turns a rich pink from the brilliant red skin color. Two cautionary notes about Jonathans are that they have a relatively short storage life, and they are not considered especially good for baked apples. From Ulster County, New York, the Jonathan dates back to the mid-1800s, from an Esopus Spitzenburg seedling. THIS RECIPE for “Juniper and Apple Soup” comes from Massachusetts native Bea Ruggles Dobyan, now living in Missouri, via Michigan (she found it at a Spice Merchants shop in Ann Arbor). “It sounded different,” Bea writes, “and that’s the kind of cooking I like.” She will serve it as the first course at a dinner party this weekend, and says it is a great opener for a fall day. Put juniper berries, cardamom pods, allspice, and cinnamon stick in a piece of cheesecloth and tie together with string. Tie the parsley together with a string. Heat oil in a pan, add apples, celery, shallots, and ginger. Season with salt and pepper. Cover the pan, and cook gently for 10 minutes. Add the stock and apple cider and stir well. Add the spices and parsley. Bring slowly to a boil, then lower the heat and simmer for 40 minutes. Remove the spices and parsley. Pour the soup into a blender and purée. Then pass it through a sieve (strainer) into a clean pan. Bring to a boil and add the cream and the Armagnac/brandy. Add salt and pepper if necessary. Serve hot, garnish with fresh parsley. Optionally, you can add cooked ham and crispy bacon, as well. 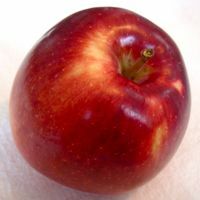 BECOME A FACEBOOK FRIEND of New England Apples by visiting www.newenglandapples.org.